>...i'm new to the subject of passive solar systems in architecture. version for the 2005 ises conference in orlando, fl. >warm air to the lower story? vertical duct and blower and return it to the 2nd floor via a stairway. keep the ground floor warm. >in order to avoid the reversed thermall process=heat loss. water stand up isn't easy. where would you empty it to? written by nick pine, with steve baer, drew gillett, and rich komp. 1. heat flows like electricity. 2. solar heat can be 100 times cheaper than solar electricity. 3. superinsulated houses have to be very small or very large. 4. direct gain houses can be improved. 5. indirect gain can be more efficient. 6. we might store heat in the ceiling. 7. we might have a separate cloudy-day heat store. 8. low temp heat storage and distribution are difficult. 9. shurcliff's lung might be a good air-air heat exchanger. 10. greywater heat exchangers can help. 11. we might also gather heat from pvs. 12. smart ventilation can be helpful. 13. swamp cooler controls can be improved. energy. house heating and cooling accounts for about one third of that. of oil per day in 2003. what was the real cost per gallon? glazing at $1/50w = 0.02/pw. and sunspaces add floorspace to a house. b) buy 60-14 = 46 additional watts of pv power or c) caulk the house? spend his time in an agreeable manner, for instance with the nice girls. but instead of that we had to perform big and awful calculations. 97% efficient. if it is, why bother with solar hot water? 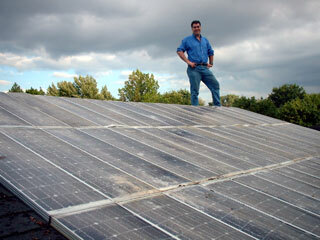 electricity from water-cooled standard pv panels. engineer with civil engineering and architectural degrees. tried. we do not accept responsibility for their safety or functionality. a mouse-hour. one btu can heat one pound (16 ounces) of water one degree f.
from 50 to 200 f to make a cup of tea? to 3.41 btu. if energy were miles traveled, power would be miles per hour. if energy were a paycheck, power would be an hourly rate of pay. a 300 w immersion heater? people often confuse power and energy, as in "my house uses lots of power"
measured in watts or kw. unlike energy, it can't be used or consumed. is much hotter. a lower minimum usable temperature increases useful heat. about 1 kwh, with a much longer lifetime and simpler i/o. power p = ie = 120vx2.5a = 300 watts. the us "r-value" stamped on foamboards and batts in hardware stores. loses about 2+v/2 btu/h-f. larger objects have lower film conductances. tiny cold soap bubbles (1/16" at 50 f) have an r-value of about r3 per inch. refugee shelters this way in a cold climate. of r20/(8'x10') = 0.25 f-h/btu. we might call this "0.25 fhubs" or "4 buhfs." in parallel, and add fhubs for series layers of wall insulation. a 12 f temp diff, what's the wall's thermal resistance in fhubs? exercise 3.2: what's the thermal conductance of an 8'x16' r10 wall? in the form of sheathing and drywall, which lowers the overall r-value. insulation framed with r1 per inch 2x4s on all edges as a "stud conductor"
10.66ft^2/1.306buhf = r8.2, vs r13, without the studs. would allow (70f-30f)8'x24'/r24 = 320 btu/h of heatflow. than us u-values. a metric u1 window has 1 w/m^2c of thermal conductance. = 10 watts of heat power. a 20 c temperature difference? with 70 f air inside and 30 f outside? a 40 f temperature difference? sleeping bags. can a person heat a house with the help of a few dogs? 30 f outside, with six outdoor faces, and it's heated by one person? two dogs? with three dogs? with three dogs and r50 strawbale walls? 13.2l^3 = (70-30)6l^2/r20, l = 12/13.2 = 0.91', with 48 mice in 6 rooms. exercise 4.3: how big is l, with r10 walls? ashrae dog makes 354.9 btu/h. a 1,000 pound jersey calf makes 4,000 btu/h. capturing energy on a grand scale." r50 strawbales, 474+300 btu/h = (70-30)6l^2/r50 makes l = 12.7 feet max. inside an l' r20 cube, what's l, min? but some people define a "solar house" as "one with no other form of heat,"
into the window all day. this is a crude but useful approximation. if 1000 btu/ft^2 falls on the window over a long string of average 30 f days? falls on a south wall on an average 29.7 f day, and 1370/(65-29.7) = 38.8.
solar heat per degree day, on average. this is usually december or january. like "we only burn a few cords of wood per year." how vague. what's "a few"? every day is sunny for george and charlotte britton of lafayette hill. lower than one of comparable size... the design incorporates "passive"
colder months... britton says "we have a fire every day of the winter." solar houses with no other form of heat are 100% solar-heated, with no doubt. architects pay clients backup heating fuel bills, if any? about heating bills in 1975.
with thermal mass, but people can change. and half walls, like an early los alamos labs passive solar test cell. falls on a south wall on an average 40.2 f december day)? has a specific heat of 0.16 btu/f-lb and stores about 0.16x32 = 5 btu/f. an r fhub cube outside c btu/f of thermal capacitance has a "time constant"
squashes the initial temperature difference of (75-30) = 45 degrees. exercise 6.1: what's t(d) after 1 day? 65 = 30+(75-30)e^(-185d/n), ln((65-30)/(75-30)) = -185d/n, and n = 738d. persistence, like a 3-state (clear, average, cloudy) markov chain. water is a good ballast foundation :-) and pet bottle walls leak water vapor. they might need topping up once a year. we can fit about 9 4" diameter by 12"
exercise 6.2: what's the time constant of an "empty" 8' cube with a 1/2"
temperature be at 7 am? what would it be if we add 1000 concrete blocks? because of the high airfilm resistance at the mass surface. indirect gain? how many are needed to store heat for 5 cloudy days? people power, even the outdoor shutter over the wall of steve baer's house. david delaney  invented (on paper) a "flow-organizer"
use "deep-space coolers" that open to radiate heat as needed. would like to help make them in nicaragua. smaller vent holes with less conduction loss to the sunspace at night. timer and its $4.37 5x852 octal socket. what is the mean size and standard deviation of house envelope cracks? cavity? what about freezing and condensation? canadian housing development holds the world record for low air leakage. first used in sweden in 1977, where it was actually a blower window. belts?] to hook it up to a pair of double doors and perform the test. the airstream is qdt = 16.6asqrt(h)dt^1.5 btu/h, approximately. radius, held together with 1x3 spacer blocks and deck screws every 2'. with air during the day and soap bubbles at night is one way to do this. a cloudy-day cube conductance of 6x64/20 = 19.2 btu/h-f.
97.5 f, and 3.7k btu/h = 16.6asqrt(8')(97.5-70)^1.5 makes a = 0.55 ft^2. we might use 1 ft^2 vents with an 8' height difference. 9. less mass with more a larger temp swing? which makes t = 137 f, if gain equals loss on an average-day. btu/f, or 22.0 pounds (4.12") of water per square foot of ceiling. 8' r32 cube with an 8'x8' r2 sunspace window with 80% solar transmission? solar pioneer harold hay built houses with roofponds and movable insulation. must be transmitted, absorbed, or reflected. radiation obeyed. t+a+r=1. with constant emissivity that doesn't depend on wavelength. have emissivities close to 0.
with e = 0.2 in 300 btu/h-ft^2 sun on a 20 f day? was completely destroyed. we suppose this is a success, of sorts. conference, august 15th-20th, winnepeg, volume 2, pp 138-145.
if tb is their average temperature, the "linearized radiation conductance"
a slow ceiling fan and a thermostat to bring warm air down on cloudy days. heat. the other 672-206 = 466 btu/h might come from q cfm of airflow. watts, so it could move 217 cfm with 1 watt, running 11% of the time. the ceiling, with t(6) = 120-48e^(-576/657) = 100 f.
or 184 gal. or 23 ft^3 of water cooling from 120 f to 70 f over 4 days. we need 2 vents with a = 0.86 ft^2 for natural airflow into the cube. awkward but doable with two keystone kops trying to avoid kinks. does not mean a good heat exchanger!" i wonder what she means by that. tested to 500 psi. the price is $59.99 from any true value hardware store. parts above are fresh water plumbing. subtotal $39.33. output feeding the cold water shower inlet as well as the water heater. coils of 1" pipe might be 0.0004227x150x(1.25/2)^1.852x1^-4.871 = 0.03 psi. temperature. the 1500 w heater might operate 2kwh/1.5kw = 1.3 hours per day. an octagon and aluminum foil tape to cover the kerfs and hold it closed. energy systems also does this sort of thing, and lives in a roofpond house. (>150 f), with straps over the poly film to prevent outward ballooning. a well-insulated and seldom used cloudy-day store. 200 btu/h-f conductance and a 2400 ft^2 radiant floor 70 f on a 30 f day? water and kill biological growths with solar heat. linear foot) that lays flat to 48", with 1-2" of water inside during the day. they should have a long lifetime under 2-3 suns. your milage may vary. don booth built a beadwall attic with waterbed heat storage in concord, nh. regardless of the external climate and availability of natural light. sun could be distributed uniformly, or 2%, counting losses and nonuniformity. or 4%, to have enough light on overcast days. and an overhang that's reflective underneath and a reflective north ceiling. the winter solstice and exclude it all on the summer solstice. the top of the glass. shading and light-colored walls help. plants on trellises come to mind. without the weeds, which only cool air. attics and sunspaces need venting. the air can hold, which depends on the air temperature. a t-shirt.) the ashrae comfort zone relates temperature and humidity ratio. experiments have found that people in developed countries are "comfortable"
most comfortable. can we keep our cube in the zone with night ventilation? every night until the inside air temp drops to 70.6 f.
that's shunted at night with a q cfm airflow conductance. the ceiling with a gable vent or a thermal chimney above a flat roof. the house mass. brand electronics may soon sell such a fan controller. and twb (f) is the wet bulb temperature. radiation. air at the dew point temperature is saturated with water vapor. so tdp = 9621/(17.863-ln(pa)) = 514 r or 54 f in boulder in july. air would lose 1.63x10^-9((70.6+460)^4-0.7399(58.6+460)^4) = 42 btu/h-ft^2. since poly film is essentially transparent to radiation. which water depth will keep it coolest in an r5 3" diameter x 6" tall cup? 100(e^(17.863-9621/tw)-0.427) = 58.6+460-tw, so tw = 9621/(22.47-ln(561.3-tw)). swimming pool formula says q = 100(pw-pa) btu/h-ft^2, regardless of air temp. vent air. as they become equal, swamp cooling and misting no longer work. rises to to = 134.2-4500(0.0056) = 109 f.
that turns on a $12 window exhaust fan when the rh rises to 56%. wired to open or close on humidity rise. pw = 1.033 "hg at 80.2 f and 100% rh, and pi = 0.566 "hg with wi = 0.012.
might build up an interesting mineral encrustation that helps evaporate water. outdoor air enters the top of a gabion and leaves via the sides? in a greenhouse and filter the rest through a high-temp wetland? with a slot in the inner layer above the trough to allow air to recirculate. to make an artificial wetland. 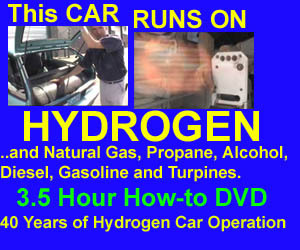 240 gallons per day (0.908 m^3/day) with 0.175 lb of bod, ie 86 mg/l. growth biological reactors." they work well at higher temperatures. bod removal in subsurface-flow wetlands at 20 c is k20 = 1.104d^-1. the bed into 3 series cells for better plug flow and performance. gain in ac efficiency as a result of misting the air around the hot coil. i've measured 20% by trickling rainwater over a window unit. floor that acts as a "chemical heat pump." would conserve more energy if they paid the whole cost at the pump. 0.2: c) $20 worth of caulk might halve the air leaks and the heating bill. water and little heat flows into the room. 1.2: 75x60m/h/(300x3.41) = 4.4 minutes. 2.1: 12v/24a = 0.5 ohms. 3.3: 20cx2mx4mxu0.5 = 80 watts. 3.4: it would pass (70f-30f)3'x4'x0.25btu/h-f-ft^2 = 120 btu/h of heat. 3.5: 40fx24'x32'/r64 = 480 btu/h. 4.1: 350 btu/h = (70f-30f)6l^2/r10 makes l = sqrt(350/24) = 3.82 feet, max. l^2+16l-406.25 = 0, and l = (-16+sqrt(16^2-4(-406.25))/2 = 13.7'. 16-story cube, something like the borg, or a large anthill. t = 30 + 133/12 = 41 f.
without more insulation or mice or people or indoor electrical energy use. 6.1: t(1) = 30+(75-30)e^(-1) = 46.6 f.
is good for direct gain, but bad for night setback savings. and after 2 weeks, t = 67.0. this is a good direct gain house, for a fish. of 6x64/r20 = 19.2 vs 34 btu/h-f, with rc = 4.4n/19.2/24 = 0.00955n days. -523.6/n = ln((65-30)/(75-30)), and n = 2083. 8.1: the 0.08x2400 = 192 ft^2 of windows have 192ft^2/r4 = 48 btu/h-f.
758.9/64 = 11.9 pounds (2.22") of water per square foot of ceiling. = 752 btu/f, ie 752/64/64x12 = 2.20" of water. btu/h flows from c, so dt/dt = -i/c = -2t/c + 14.3/c, and 14.3/2 = 7.1. = 427 btu/f, ie 427/64/64x12 = 1.25" of water. 10.1: 300 btu/h = 0.1714x10^-8x0.2(t^4-(460+20)^4) makes t = 982 r or 522 f.
13.1: i = (70-30)200 = 8k btu/h. t = 70 + i/(2400x1.5) = 72.2 f.
fountain pump and a float valve in the bottom.